STILL THE GREATEST WRESTLEMANIA EVER! And I was there! Along with 93,000 other fans in what was, at the time a new attendance record for an indoor event. Let me tell you, if you've never been at the Pontiac Silverdome there's two things you need to know. First, it's VERY loud and with that many fans it was absolutely deafening. Second the Silverdome had no air conditioning. Thank God it was early Spring and not Summer as it was Still pretty oppresive with all those people in one place. 1) Can-Am connection vs. Cowboy Bob Orton and The magnificent Muraco. Good Solid Match. 2) Hercules Hernandex vs. Billy Jack Haynes in a crappy short match. 3) Hillbilly Jim teaming with 2 midgets against King Kong Bundy and two midgets in a hilarious mixed tag match with Bob Ufer doing color commentary. 4) The Junk Yard Dog agains Harley Race. Includes the worst chair shot in history as JYD barely taps Race and knocks him out cold. 5) The Rougeau Brothers vs. Brutus beefcake and Greg the Hammer Valentine. Another solid match. 6) Roddy Piper Vs. Adrian Adonis in Piper's "retirement" match. Yeah Right. Piper wins and Beefcake cuts Adonis' hair. Fun match. 7) The British Bulldogs and Tito Santana vs. The Hart Foundation and Evil referee Danny Davis. 8) Koko B. Ware Vs. Butch Reed. Basically a throwaway match. 9) Randy Savage vs. Ricky Steamboat for the Intercontinental title. One of the greatest Wrestlemania matches of all time. Two great workers at the peak of their careers. Numerous two-counts and great action throughout. 10) Jake Roberts with Alice Cooper vs. The Honky Tonk Man. Solid match again. 11) Iron Sheik & Nikolai Volkoff vs. the Killer B's. hacksaw Jim Duggan ends the match by clubbing the Iron Sheik with his 2 x 4. 12) Hulk Hogan vs. Andre the Giant. The most important match in Wrestlemania, maybe all of Wrestling history. Not a great match technically since Andre was so old and couldn't move well, but momentous for Hogan's incredible feat of strength in a full body slam of Andre and retaining the WWF Title. Although the Hulk Hogan / Andre the Giant main event is the most notable match of this event, the contest between Ricky `the Dragon' Steamboat and Intercontinental champ `Macho Man' Randy Savage was the best of the bunch. It's nearly twenty minutes of momentum-changing action, featuring plenty of near-falls by both men. George `The Animal' Steele acts as the Dragon's corner man, and helps him get back inside the ring after taking some pretty hard bumps on a few occasions. Although it featured King Kong Bundy (one of my all-time faves), the midget tag-team match he was part of (with Lord Littlebrook & Little Tokyo versus Hillbilly Jim, Little Beaver and the Haiti Kid) was a wash. The little guys didn't really do that much rasslin', really; Little Beaver spent most of his time running away from Bundy after hittin' him with a couple highly ineffective quick shots. It did have one particularly amusing moment, however: Bundy managed to kick out of a cover by Hillbilly Jim and his two diminutive partners, both of whom practically flew right off of the big man! The hair match between the apparently-retiring `Rowdy' Roddy Piper and `Adorable' Adrian Adonis was pretty hokey, although it was helped by a couple amazing `bumps' by Adonis. The Adorable One even does the ol' trick of trying to hit an opponent outside the ring with a big pair of shears, hits the top ring rope instead, and it causes the shears to bounce back and smack him in the head. Piper's finishing sleeper hold-which looked really bad- on Adonis put an end to the match, and Brutus Beefcake earns his moniker of `The Barber' by doing the honors of trimming the tresses of the vanquished. The last hour of the tape is dedicated to the main event. The first half-hour is a buildup to the match, featuring segments from Saturday Night's Main Event that set up this historic contest, as well as a wonderful pre-event interview with a perfectly-coiffed `Brain' where he proclaims his confidence in Andre winning the championship. Also thrown in is a press conference featuring plenty of amusing sniping between Heenan and `Mean Gene' Okerlund. One could tell Andre was nearing the end of his career as a wrestler when he plodded into frame and sat down during the press conference: he was barely able to move about, and his shirt was drenched in sweat. Andre was also pretty slow in the ring, but he and Hogan worked things out to make it look good, and kept it going for about ten minutes. Bob Uecker, who was hangin' around Gorilla Monsoon and Ventura-- who pounded on him mercilessly with his trademark taunts-- during the whole event, acted as the ring announcer for the championship match. Mary Hart (the co-host of Entertainment Tonight with the blindingly-bright smile, who attempted to get a few words from Miss Elizabeth prior to the Macho Man's IC belt bout) acted as the bell-ringer. The height of ALL Wrestling! This wm will be remember this one for many reasons. No wm up to this point has came close to reaching the attendance record of 93,000 plus fans, Hogan vs Andre, Savage vs Steamboat and much more. The whole card together wasn't great but still a solid show from start to finish. Here's the card and my ratings. - Alot of people have given this 3 stars but I didn't think it was that good. Muraco and Orton didn't do much here. Can Am dominated about 90% of the match. Can Am uses some great technicial wrestling and high flying action here. Martel pins Muraco with a high cross body while his partner does a schoolboy trip from behind. - The battle of the full nelson. Both guys use some good power moves. Too bad it had to end in a lame double countout finish. Solid performance both men. - Short and boring. The only exciting part of the match is when Bundy slams a midget and drops an elbow on him. - Another really short match. The only saving grace behind this match is Race doing some good selling for JYD. Loved the part where JYD was laying on the outside of the ring and Race tried to do a flying headbutt but missed. Race wins with a belly to belly suplex and JYD had to bow down to the king. - Once again we had another really short match that had the potential of being a good match. They manage to pack in some decent action. Dino Bravo's outside interference helped the Dream Team win but Beefcake decides that it's time for him to do his own thing. - this was a hair vs hair match and Piper's last match (well we know that was a lie). Lots of brawling and crazy selling by Adnois makes this a fun match to watch. Adnois had a sleeper on Piper but release the hold which allowed Beefcake to interfere and Piper would seize the opportunity and put his sleeper on Adnois for the win. - Davis was responsible for his bias officiating by screwing Santana and Bulldogs out of their titles. Match could've been better but the beatings Danny Davis received was very fun to watch. Davis hits Davey Boy Smith with a megaphone for the win. - Neither one of these men did anything in their careers. Battle of the jobbers. Reed wins when Koko went for a high cross body but Reed roll over and grabbed Koko's tights. into Steamboat's throat, but George "Animal" Steele pushes Savage off. Savage goes to slam Steamboat only to have it countered into a small package and Steamboat becomes the new IC champ. It's very rare that you see a match where the competitors go at and have a fast paced match with be able to perform the moves accurately. A must see. - match was rather slow and there wasn't much wrestling involved. Mostly just Jake throwing punches and Honky didn't look like he was trying. Alice Cooper came out on behalf on Jake but Honky was able to cheat his way to victory. Jimmy Hart gets a close up look of Diamian. - Another short but decent match. Sheik and Volkoff were working over Jim Brunzell for the most of the match until Hacksaw Jim Duggan comes in and whacks Sheik in the back with the 2x4 for the DQ finish. Could've been much better if it lasted longer. - Okay the match was not a great wrestling match but it got it's point across. The match is a classic for obvious reasons. It was the first time in 15 years (or that's what they say), Andre ever lost a match and was ever bodyslammed. Amazing sight to see. The fans were on the edge of their seat the whole way. In short, Wrestlemania 3 was not a great show because many of the matches were too short. There isn't that many good matches to hold the event up but it still has some shining moments. Their were 2 matches that will stand on in the minds of many wrestling fans. ...But that's about all, to be honest. I mean, we all know about the Hogan-Andre match and I'd heard a lot of hype about how great it was back then, but now the actual match (along with the rest of the event) isn't as thrilling as I'd anticipated. Of course, it was incredible to see Hogan bodyslam Andre (could anybody else ever do that? ), and some of the celebrities were amusing, but I found myself slightly disappointed with the wrestling styles. Truly the greatest of all time! It's debatable whether or ont this is the greatest Wrestlemania but you can't help but give this 5 Stars. Why? Well this is what truly made the WWF far bigger, far badder and far better than any other wrestling promotion. I mean if you can manage to get 93,173 fans into one venue to watch pro-wrestling you must be doing something right! WRESTLEMANIA III: Another Historic Night For The WWF! "Wrestlemania III" is regarded by many as one of the greatest Wrestlemania's of all-time and with its indoor attendance record of 93,173, it is hard to disagree. 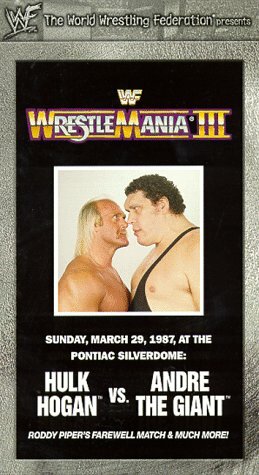 The main event which featured WWF champion, Hulk Hogan defeating the man who many considered to be unstoppable at that time, Andre The Giant featured many historic moments including Hogan's infamous bodyslam of Andre that almost took the roof off the Pontiac Silverdome. Another match that is considered by wrestling purists to be one of the greatest ever was the legendary battle between Randy "Macho Man" Savage and Ricky "The Dragon" Steamboat. Many of today's stars look at this classic match as a blueprint for how to pull off a five-star match. My heading does not refer to the Hulk v. Andre match. At the time, Andre was having serious back problems which later got much worse. If you want to see him in action, watching the movie "Princess Bride" is a better choice, and also one where his character is more reminiscent of his true self, as a gentle and caring giant of a man in more respects than one, and, for great moments in Hulk's career, I'd recommend Hulk Hogan v. Ultimate Warrior in Wrestlemania VI, where there's quite a twist at the end when it seems things are progressing just as they always are at the end of Hulk Hogan's matches, and also unusual in being a match between characters who are sort of friends. I remember first seeing this around the time of Wrestlemania IV, back when I was so little I still thought wrestling was real, but even considering that the matches are orchestrated and planned beforehand, this is a thrilling one to watch. Apart from that, Wrestlemania III is pretty much a more mediocre blend of what comes before and after this key match in wrestling history. If that match is found on any "best of" DVD's (I'm not sure what is out there), go for that rather than the Wrestlemania III video. You're not a wrestlingfan if you don't like it. Originating from the Silverdome in Pontiac, Michigan, this 1987 rendition of Wrestlemania has stood the test of time as the best wrestling event ever produced for mass audiences. Despite its announcing crew repeatedly bragging about the supposed record crowd of 93,000 +, the WWF somehow put all of its classic elements of action, humor, and character development together flawlessly for a magical three-hour production. 1. The Can-Am Connection vs. the Magnificient Muraco and "Cowboy" Bob Orton: The event gets off to a solid start as the Can-Ams salvage a routine match for a fast-paced finish. 2. Hercules Hernandez w/ Bobby Heenan vs. Billy Jack Haynes: A pretty good battle is wasted by its double count-out finish. 3. Hillbilly Jim, Little Beaver, & the Haiti Kid vs. King Kong Bundy, Little Tokyo, & Lord Littlebrook: A quick novelty match has some amusing highlights including Little Beaver & the Haiti Kid doing a double-team on the other midgets, with a "little rowboat action," as Gorilla Monsoon described it. 4. Junkyard Dog vs. Harley Race w/ Bobby Heenan & the Fabulous Moolah: Race does a few pratfalls, but he still wins, anyway. JYD, in turn, then crowns the "King of Wrestling" with a chair after bowing to him (per the pre-match stipulation). The match is over in just a few minutes, as both wrestlers clearly appeared past their prime. 5. The Rougeau Brothers vs. the Dream Team w/ Dino Bravo & "Luscious" Johnny V: While the match is notable for setting up the "face" turn of Brutus Beefcake, it also leads to the new "Dream Team" combo of Greg Valentine and Dino Bravo. 6. Roddy Piper vs. Adorable Adrian Adonis in a haircut match: Billed as his retirement match, Piper gives the audience a great going-away present by humiliating Adonis and Jimmy Hart in grand fashion with some last-minute help from Brutus Beefcake. Terrific pratfalls from Adonis and Hart!!! 7. The British Bulldogs & Tito Santana vs. The Hart Foundation and Danny Davis: This is a solid six-man tag match well worth watching as the Bulldogs and Santana seek vengeance on Davis for his crooked refereeing. The Harts & Davis sneak away with the win. 8. Koko B. Ware vs. Butch Reed w/ Slick: A quickly forgettable filler match (Reed wins) is salvaged only by Tito Santana going after Slick at the end. 9. Ricky Steamboat w/ George "The Animal" Steele vs. champion Randy Savage w/ Ms. Elizabeth for the Intercontinental Title: These two guys give a superb effort in an awesome 15-minute action-packed match, which truly defined the event's historical importance in pro wrestling. Although Steamboat wins the championship, Savage proves why he would move on to the big prize a year later. 10. Jake Roberts w/ Alice Cooper vs. the Honky Tonky Man w/ Jimmy Hart: It's the big upset of the evening as Honky Tonk steals the win. With Alice Cooper at his side, Jake and his pet snake, Damian, get even with Jimmy Hart. 11. The Killer Bees vs. the Iron Sheik & Nikolai Volkoff w/ Slick: A mostly dull match (DQ win for the villains) which is not really helped by the 2x4 swinging presence of newly arrived "Hacksaw" Jim Duggan. 12. Andre the Giant w/ Bobby Heenan vs. champion Hulk Hogan for the WWF World Title: Although Andre clearly was not in good health in this historic match, he gives it his best effort, as the unforgettable ending will attest. It's arguably the peak of Hulkamania! Of all the Wrestlemanias, buy this one if you can. One of the greatest PPV of all time. Wrestlemania 3-Greatest card ever put on! No collection should be without it!